Reverse cholesterol transport (RCT) has been characterized as a crucial step for antiatherosclerosis, which is initiated by ATP-binding cassette A1 (ABCA1) to mediate the efflux of cellular phospholipids and cholesterol to lipid-free apolipoprotein A-I (apoA-I). However, the mechanisms underlying apoA-I/ABCA1 interaction to lead to the lipidation of apoA-I are poorly understood. There are several models proposed for the interaction of apoA-I with ABCA1 as well as the lipidation of apoA-I mediated by ABCA1. ApoA-I increases the levels of ABCA1 protein markedly. In turn, ABCA1 can stabilize apoA-I. The interaction of apoA-I with ABCA1 could activate signaling molecules that modulate posttranslational ABCA1 activity or lipid transport activity. 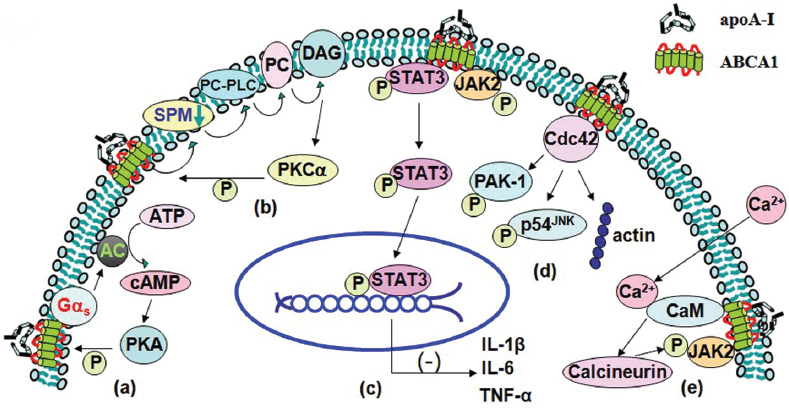 The key signaling molecules in these processes include protein kinase A (PKA), protein kinase C (PKC), Janus kinase 2 (JAK2), Rho GTPases and Ca2+, and many factors also could influence the interaction of apoA-I with ABCA1. This review will summarize these mechanisms for the apoA-I interaction with ABCA1 as well as the signal transduction pathways involved in these processes. High density lipoproteins (HDLs) have been shown consistently to be related inversely to cardiovascular disease risk (1,2). An important aspect of HDL function is its role in reverse cholesterol transport (RCT), in which HDL transfers cholesterol from peripheral tissues to the liver for elimination (3, 4, 5, 6, 7). Lipid-poor apolipoprotein A-I (apoA-I), the major component of HDL, interacts with ATP-binding cassette A1 (ABCA1), which exports free cholesterol (FC) and phospholipids (PL) from cells and servers as the first step in RCT (8, 9, 10, 11). There is no unified recognition of how apoA-I interacts with ABCA1 and the lipidation of apoA-I. Understanding the mechanisms regulating the interaction of apoA-I with ABCA1 would clarify the molecular details of cellular cholesterol efflux and further help to develop strategies to increase plasma HDL concentrations. In addition to lipid metabolism regulation, apoA-I/ABCA1 interaction is involved in the process of apoptosis and inflammation, which also were thought to play crucial roles in the development of atherosclerosis (12, 13, 14). Therefore, the interaction of apoA-I with ABCA1 could connect inflammation and RCT in vivo. In this review, we will focus on the mechanisms of the interaction of apoA-I with ABCA1 as well as the signal transduction pathways involved in this process. The molecular mechanism of apoA-I binding to ABCA1 is not very clear since ABCA1 has been found to have a broad specificity for multiple HDL-related apolipoproteins, including apoA-I, A-II, C-I, C-II and C-III (15). These binding sites in ABCA1 also recognize the 18-mer synthetic amphipathic α-helix and phospholipid transfer protein (16). Electron microscopy studies have shown that human fibroblasts and THP-1 macrophages expressing ABCA1 display 10- to 60-nm plasma membrane projections that bind more than 80% of exogenously added apoA-I (17). Chambenoit et al. (18) suggested that apoA-I is likely bound to phosphatidylserine (PS) that is presented at the exofacial leaflet of cell membrane by the “floppase” activity of ABCA1. Interestingly, Smith et al. reported that the increased PS was insufficient to mediate cellular apoA-I binding and lipid efflux, because annexin V, a PS-binding protein, did not compete with ABCA1-induced apoA-I binding, nor did it affect ABCA1-mediated lipid efflux to apoA-I (19,20). Furthermore, covalent cross-linking studies have revealed that apoA-I binds directly to ABCA1 with high affinity Kd <10−7mol/L) and saturability (15,21). This binding process is temperature sensitive and readily reversible. Overexpression of the full-length cDNA of ABCA1 in cells resulted in increased apoA-I binding to the cell surface (17). All these findings suggest that apoA-I directly binds to ABCA1 to form a complex that facilitates cellular cholesterol and phospholipid efflux. The current model proposed that ABCA1 creates two sites separately for binding of apoA-I and lipid efflux. Although the low capacity site was formed by direct apoA-I/ABCA1 interactions, the much higher capacity site generated by apoA-I/lipid interactions functions in the assembly of nascent HDL particles (22, 23, 24). The low capacity site for apoA-I binding on the ABCA1 has been deemed to have regulatory functions. However, this proposed model regarding ABCA1 activity creating two binding sites for apoA-I does not distinguish whether apoA-I/lipid binding precedes apoA-I/ABCA1 interaction or the opposite. Some studies support the assumption that the binding of apoA-I to ABCA1 helps targeting apoA-I to lipid domains (25). Elucidating the mechanism of interaction between apoA-I and ABCA1 will increase our understanding of the lipidation of apoA-I. Although the majority of cholesterol resides in the plasma membrane, the second largest cellular cholesterol pool is in endosomes (26). ABCA1 is located not only in the cell surface, but also in the intracellular vesicles, including endosomes and lysosomes (27). Studies have provided evidence that extracellular apoA-I may be endocytosed and recycled back to the cell surface before its release from the cells (28,29). ABCA1 recycles rapidly between the plasma membrane and late endosomal/lysosomal compartments through the apoA-I-containing intracellular vesicles (27,30, 31, 32, 33). However, subsequent studies quantitating cholesterol efflux from the endocytic pathway indicated that the intracellular vesicles transport represented less than 5% of the total cellular efflux capacity due to the degradation of a large fraction of the resecreted apoA-I. Therefore, we concluded that the plasma membrane is the main platform where ABCA1-mediated lipidation of apoA-I (26,34). Although apoA-I does not alter ABCA1 mRNA abundance, it increases the content of ABCA1 protein markedly, suggesting the effect of apoA-I on ABCA1 degradation (35). Studies have shown several possible mechanisms that contribute to ABCA1 protein stabilization; for example, interactions of ABCA1 and apoA-I interfered with the phosphorylation of the PEST sequence and reduced calpain-mediated proteolysis (10,36, 37, 38). ApoA-I increased levels of wild-type ABCA1, but not the mutant ABCA1 deleted by the PEST sequence. In addition, apoA-I pretreatment of cells blocked the degradation of the wild-type ABCA1 (36). ApoA-I failed to increase ABCA1-W590S levels in these studies, suggesting that apoA-I binding was not sufficient for ABCA1 stabilization (36). These results favor the hypothesis that apoA-I-mediated ABCA1 stabilization may result from local changes in membrane phospholipids that decrease the binding of ABCA1 with the calpain subunit (39). Another interpretation is that apoA-I fails to bind the W590S mutant in the correct orientation, and therefore the appropriate conformational change of ABCA1 required to decrease calpain proteolysis does not occur. Helical ApoA-I in its lipid-free form stabilizes ABCA1 by protecting it from thiol protease-mediated degradation (40). In conclusion, apoA-I facilitates ABCA1 accumulation to cell surface by inhibiting its intracellular degradation (41). ABCA1, in turn, can stabilize apoA-I. Familial HDL deficiency diseases, such as Tangier disease, can result in increased catabolism of apoA-I (42), and ABCA1 single nucleotide polymorphisms could change the fasting and postprandial values of apoA-I (43). Initial interaction of apoA-I with ABCA1 imparts a unique conformation that partially determines the in vivo metabolic fate of apoA-I (44). If apoA-I is lipidated to form pre-β2, -3, or -4 HDLs by ABCA1, these particles will undergo further lipidation by non-ABCA1 mediated pathways, and ultimately be converted to mature plasma HDL particles by LCAT in plasma. On the other hand, when apoA-I is poorly lipidated, with only a few ABCA1 at the cell surface, it will not contain enough lipid to prevent its rapid clearance from plasma by the kidney. In addition, ABCA1 also modulates the transcytosis of apoA-I through endothelial cells (45). The interaction of apoA-I with ABCA1 could activate signaling molecules that modulate ABCA1 level or its mediated lipid transport activity in a posttranslational manner. The signal transduction pathways initiated by the interaction of apoA-I with ABCA1 include protein kinase A (PKA), protein kinase C (PKC), Janus kinase 2 (JAK2), Cdc42 and Ca2+. Various signal transduction pathways including PKA, JAK2, RhoA and Ca2+ exist in macrophages, while PKA and Cdc42 have been found in fibroblasts, kidney cells and other cells. The presence of specific pathways in specific cell types was listed in Table 1. The signaling proteins and their activities in different cells. ↑, Increased expression, enhanced activity or effect; ↓, decreased expression, inhibited activity or effect. The interaction of apoA-I with ABCA1 in cells increases the cellular cyclic adenosine monophosphate (cAMP) content and ABCA1 phosphorylation (49), suggesting that apoA-I may activate cAMP signaling and raise the possibility of the phosphorylation of ABCA1 via various signal-relating molecules, which allows apoA-I to be lipidated through different pathways. Pharmacological inhibition of PKA completely blocked apoA-I mediated ABCA1 phosphorylation (63). In this course, apoA-I binding to ABCA1 transporter which couples to Gαs leads to activation of adenylate cyclase (AC), cAMP production and subsequent PKA-mediated ABCA1 phosphorylation, allowing increasing lipidation of apoA-I (Figure 1A). This phenomenon has also been comfirmed by our previous studies (52,64), which showed that apoA-I, in combination with forskolin (an adenyl cyclase activator), contributed to a much larger increase in protein expression of ABCA1 and cholesterol efflux from THP-1 macrophage-derived foam cells. In converse, treatment cells with apoA-I and SQ-22536 (an adenyl cyclase inhibitor) downregulated protein expression of ABCA1 markedly and decreased cholesterol efflux. The binding between apoA-I and ABCA1 effects signal transduction pathways. (A) ApoA-I binding to ABCA1 which couples to Gαs leading to activation of AC, cAMP production and subsequent PKA-mediated ABCA1 phosphorylation, allowing lipidation of apoA-I. (B) ApoA-I initially removes SPM in the presence of ABCA1. Then the decreasing SPM in plasma membrane triggers PC-PLC activity. PC-PLC catalyzes the hydrolysis of PC to generate DAG. And, finally, DAG activates PKCα and then PKCα phosphorylates ABCA1. (C) The interaction of apoA-I with ABCA1 increases phosphorylation of JAK2 and thus activates JAK2. The activated JAK2 further activates STAT3. (D) The interaction of apoA-I with ABCA1 results in activation of Cdc42 and subsequent phosphorylations of PAK-1 and p54JNK and polymerization of actin. (E) ApoA-I induces Ca2+ influx into cells. The rise in cytosolic Ca2+ then triggers Ca2+-dependent calcineurin pathway. The influx of Ca2+ also increases phosphorylation of JAK2. However, the precise consequence of this phosphorylation is not clear. Targeted mutation of two of the most probable PKA phosphorylation sites on ABCA1 have impaired export of cellular cholesterol, suggesting that PKA may be a target molecule downstream of ABCA1 (51). A-kinase anchoring proteins contain a PKA-anchoring domain and a specific targeting motif that dictates their subcellular localizations. This allows A-kinase anchoring proteins to regulate the amplitude and duration of PKA activation locally. Loretta Ma et al. report that st-Ht31, a membrane permeable peptide inhibitor of PKA anchoring, increases cytosolic PKA activity and robustly exports cholesterol as microparticles (65). PKC activation caused an increase in apoA-I mediated cholesterol release. This study indicated that the cholesterol mobilization process was related to PKC activation by apoA-I (66). Biochemical and microscopic evidence indicated that apoA-I activated PKC and then phosphorylated ABCA1 (53). ApoA-I initially removes cellular FC, PC and sphingomyelin (SPM) in the presence of ABCA1; then the reduction of SPM in the plasma membrane triggers phosphatidylcholine phospholipase (PC-PLC) activity, which catalyzes the hydrolysis of PC to generate phosphorylcholine for the replenishment of SPM. This reaction also generates diacylglycerol (DAG), which further activates PKCα and then phosphorylation of ABCA1 (Figure 1B). These reactions eventually lead to the protection of ABCA1 from its degradation by calpain (53). In addition, apoA-I mobilizes intracellular cholesterol from the ACAT-accessible compartment for ABCA1-mediated release via a process involving PKC signaling (66), and pharmacological activation of PKC could decrease the ACAT-accessible cholesterol pool. Interestingly, in mouse fibroblast L929 cells, the PKC activation caused an increase in apoA-I-mediated cholesterol release without detectable changes in phospholipid release and ABCA1 expression. Alternatively, PKC activation can increase apoA-I dependent efflux through prevention of PEST-dependent ABCA1 degradation, which correlates with the dephosphorylation of Thr-1286 and Thr-1305 within the PEST sequence (37,53). Elevating phosphorylation of protein kinase C-ζ (PKC-ζ) recently has been found to induce binding of PKC-ζ with specificity protein 1 (Sp1), which can activate ABCA1 through physical interaction with the LXR and RXR heterodimer in the ABCA1 promoter (67). Mutation of the Sp1 binding site in the ABCA1 promoter, and inhibition of Sp1 DNA binding with mithramycin A suppressed the ABCA1 promoter activity and reduced the ABCA1 expression level. These results demonstrate that activation of the PKCζ-Sp1 signaling cascade is a mechanism for regulation of ABCA1 expression (68). It has been reported that a JAK2-specific inhibitor markedly reduces apoA-I-mediated lipid transport, and mutant cells lacking JAK2 have a severely impaired ABCA1 pathway (55,56). The interaction of apoA-I with ABCA1 for only minutes would stimulate autophosphorylation of JAK2 in cells (56). These studies suggest that the interaction of apoA-I with ABCA1 activates JAK2, which in turn activates a process that enhances lipid removal from cells (55) (Figure 1C). On the other hand, apoA-I can stabilize ABCA1 protein even in the absence of activated JAK2 because inhibition of JAK2 tyrosine kinase activity reduced apoA-I-mediated efflux without affecting the ability of apoA-I to protect ABCA1 from degradation (56). This phenomenon implies that enhancing lipid removal by activated JAK2 may be uncorrelated to the stability of ABCA1. JAK2 modulates most but not all of the lipid export activity of ABCA1, and the residual lipid transport mediated by ABCA1 may occur by JAK2-independent processes (25). It is unknown whether the JAK2-targeted protein is ABCA1 or a partner protein. The apoA-I-mediated activation of JAK2 also activates STAT3, which is independent of the lipid transport function of ABCA1 (see Figure 1C). ABCA1 contains two candidate STAT3 docking sites. The interaction of apoA-I with ABCA1 in macrophages suppressed the lysopolysaccaride-induced secretion of the inflammatory cytokines such as interleukin-1β, interleukin-6, and tumor necrosis factor-α, which was reversed by silencing STAT3 or ABCA1. Thus, the apoA-I/ABCA1 interaction activates the JAK2/STAT3 pathway (57), which is antiinflammatory in macrophages (69, 70, 71, 72). Our studies also demonstrate IFN-γ may first downregulate expression of LXRα through the JAK/STAT1 signaling pathway and then decrease expression of ABCA1 and cholesterol efflux in THP-1 macrophage-derived foam cells (71,73). Additional work is needed to understand the important role of ABCA1 in suppressing macrophage inflammation. Rho family small GTPases, such as Cdc42, Rho and Rac, regulate cytoskeletal reorganization in different ways (74). Cdc42 forms complexes with proteins that control the cytoskeletal architecture and vesicular transport (75). Initially it was observed that Tangier fibroblasts lacking ABCA1 displayed an abnormal actin cytoskeleton that was associated with decreased expression and activity of the Cdc42 (76,77). Forced expression of Cdc42 was shown to enhance apoA-I-mediated cholesterol efflux, whereas expression of a dominant negative Cdc42 impaired this efflux (59,76). The exposure of human fibroblasts to apoA-I results in a cascade of signaling events, including activation of Cdc42 and subsequent phosphorylations of PAK-1 and p54JNK and polymerization of actin (Figure 1D). ApoA-I activates Cdc42 signaling and downstream kinases through the ABCA1 transporter (58,63). Cdc42 could be immunoprecipitated with ABCA1, indicating that these proteins interact with each other. The exposure of cells to apoA-I markedly amplifies the ABCA1-Cdc42 interaction. The observations that Cdc42-ABCA1 complex formation was absent in cells expressing a C-terminally truncated ABCA1 variant, which showed impaired Cdc42-dependent signaling, suggest that the C-terminal domain of ABCA1 is indispensable for the interaction between ABCA1 and Cdc42 (58). The exact molecular mechanisms by which ABCA1 couples apoA-I binding to activation of the Cdc42 signaling cascade remain to be elucidated. Studies have shown accumulation of RhoA, RhoB, RhoG and Rac1 in fibroblasts from Tangier disease, suggesting a regulatory role of Rho family proteins in cholesterol efflux (78). Stimulation with apoA-I transiently activated RhoA, and the pharmacological inhibition of RhoA or the dominant negative RhoA blocked the ability of apoA-I to stabilize ABCA1 (24). PDZ-RhoGEF, a member of the Rho guanine nucleotide exchange factors (RhoGEFs) family, binds to the C-terminal PDZ-binding motif of ABCA1 and prevents the degradation of the transporter by activating RhoA (24). Consequently, RhoA mediates prevention of ABCA1 degradation and then upregulates cholesterol efflux. In resting cells, the cytosolic Ca2+ concentration is maintained at low levels (100 nmol/L) relative to the extracellular medium (1, 2 mmol/L). This enables cells to increase cytosolic Ca2+ levels rapidly through Ca2+ influx, often in conjunction with Ca2+ release from intracellular stores. The rise in cytosolic Ca2+ then triggers Ca2+-dependent calcineurin pathway. Incubation of RAW macrophages with apoA-I induced Ca2+ influx leading to activation of calmodulin (CaM) and its downstream target, calcineurin. An immunoprecipitation and glutathione S-transferase pull-down assay revealed that ABCA1 directly binds CaM in a Ca2+-dependent manner. The cytoplasmic loop of ABCA1 contains a typical calmodulin binding sequence of 1-5-8-14 motifs (1,245 to 1,257 amino acids). This motif is located near the ABCA1 Pro-Glu-Ser-Thr sequence, and the presence of CaM/Ca2+ protected the peptides from proteolysis by calpain. Knockdown of CaM by a specific small interfering RNA increased the degradation of ABCA1 and decreased ABCA1 protein as well as apoA-I mediated lipid release (61,79). Takahashi et al. reported that extracellular Ca2+ was required for cellular association of ABCA1 and apoA-I along with apoA-I-dependent cholesterol efflux (28). Removing extracellular Ca2+ or chelating cytosolic Ca2+ was equally inhibitory for apoA-I lipidation. ApoA-I induced Ca2+ influx into cells from the medium. And inhibition of calcineurin activity by cyclosporine A or FK506 completely abolished apoA-I lipidation. Furthermore, inhibition of calcineurin also interfered with JAK2 phosphorylation and cholesterol efflux (Figure 1E). Since Ca2+ depletion or calcineurin inhibition did not alter expression and cell surface localization of ABCA1, this is supportive of JAK2, CaM and calcineurin modulating apoA-I lipidation without directly modifying ABCA1 (62). In summary, the Ca2+-dependent calcineurin/JAK2 pathway is specifically responsible for apoA-I lipidation. Hence, Ca2+-induced activation of calmodulin could increase the involvement of JAK2 simultaneously in apoA-I-mediated efflux as well as elevate ABCA1 levels (80). However, the involvement of Ca2+ in atherosclerosis is very complex. Recent studies have shown Ca2+/CaM-stimulated phosphodiesterase 1 upregulated the β-catenin/T-cell factor signaling through phosphatase protein phosphatase 2A B56 γ subunit in proliferating vascular smooth muscle cells (63). Therefore, while some Ca2+ treatments could enhance ABCA1 activity, further research is required for a better appreciation of Ca2+-modulating drugs to promote cholesterol efflux pathways. There are various signaling pathways including PKA, JAK, CDC42 and others, which were induced by the binding of apoA-I to ABCA1 as discussed above. Although the relative importance of these different pathways in the proposed atheroprotective roles of apoA-I or HDL remains to be determined, cAMP/PKA seems to be more proved than other signaling pathways in the formation of HDL as well as the promotion of cholesterol efflux, which was thought to have the central beneficial effects of HDL. Firstly, cilostazol, a selective inhibitor of phosphodiesterase 3 that delays degradation of the cAMP, has been widely known to increase the level of HDL in human (81). Secondly, cAMP/PKA pathway promotes cholesterol efflux via increasing the expression of ABCA1 (50). In addition, Bortnick et al. found that cAMP treatment substantially increased the mRNA levels of ABCA1 in J774 and elicited mouse macrophages (46). It is worth noting that increasing cytosolic PKA activity by a membrane-permeable peptide inhibitor can even reverse the formation of macrophage foam cell through an ABCA1-dependent manner (65). There is a need for more critical evaluation in animal models and the clinic, however, of other signaling pathways and the different functionalities of HDL. ATP-binding cassette transporter G1 (ABCG1), another G class transporter, also was found to be a crucial mediator of cholesterol efflux. Knockdown of ABCG1 suppresses cholesterol efflux to mature HDL but not to lipid free apoA-I, suggesting cholesterol transport mediated by ABCG1 is different from ABCA1. On the one side, ABCG1-mediated cholesterol efflux was acting in a sequential fashion, first with the formation of nascent HDL particles generated by ABCA1, the lipids of which were then released by passive diffusion via ABCG1 (82). On the other side, in contrast to the formation of a high-affinity receptor-ligand complex of ABCA1 and apoA-I on the cell surface (12), ABCG1 did not increase cellular binding of HDL. Therefore, to date, there is no existing evidence that suggests any of signaling pathways mediated by ABCG1 has been linked to the function of HDL. Different mechanisms including ABCA1-mediated lipid efflux are suggested to account for the cellular cholesterol efflux. However, the molecular mechanism for ABCA1-mediated lipid efflux is still poorly understood, though several possible manners have been proposed. One is that ABCA1 moves FC and PL from the inner to outer leaflet of the plasma membrane, and then apoA-I loads FC and PL to generate HDL (83) (Figure 2A). It is still unclear how ABCA1 translocates their substrates across membranes. Electron microscopy and X-ray crystallography analyses suggest that the two symmetrical transmembrane bundles come together to form a chamber that scans the inner leaflet of the membrane for substrates, incorporates them into the chamber and flips them to the outer leaflet for extrusion from the cells (84, 85, 86). This involves a series of conformational changes in the ABCA1 that is driven by ATP hydrolysis in the NBD domains. Another model gives emphasis to the influence of apoA-I structure on ABCA1-mediated efflux of cellular FC and PL. In the first step, apoA-I binds to ABCA1, then hydrophobic α-helices in the C-terminal domain of apoA-I insert into the region of the perturbed PL bilayer created by ABCA1. The second step is lipidation of apoA-I and the formation of nascent high-density lipoprotein particles (87) (Figure 2B). The first step is the formation of a tight complex between ABCA1 and ApoA-I, which exhibits a half-life of approximately 30 min (15). This appears to be a necessary, but not sufficient, step for lipid efflux (88), because, in the case of the ABCA1 mutant (Trp590Ser) that is associated with Tangier disease, an apoA-I/ABCA1 complex also is formed, but the apoA-I is not lipidated (15). The third model suggests the binding between apoA-I and ABCA1 constitutively generate cholesterol- and phospholipid-rich membrane domains (89). These domains bend from the plasma membrane to relieve the strain of the densely packed phospholipids, generating curved and disordered lipid surfaces that favor apoA-I interactions (90,91) (Figure 2C). This model also has been demonstrated by the interaction of apoA-I and DMPC/cholesterol vesicles (92). In addition, Takahashi et al. speculated that apoA-I can be lipidated within intracellular compartments, where ABCA1 pumps lipids into the vesicle lumen and then lipidates apoA-I 28, (93) (Figure 2D). Models of ABCA1-mediated lipidation of apoA-I. (A) ABCA1 moves FC and PL from the inner to outer leaflet of the plasma membrane, and then loads FC and PL onto apoA-I to generate HDL. (B) ApoA-I binds to ABCA1, C-terminal domain of apoA-I inserts into the region of the perturbed PL bilayer created by ABCA1 and then is lipidated. (C) The binding between apoA-I and ABCA1 generates FC and PL-rich membrane domains. ApoA-I then interacts with lipid domains to promote their solubilization and release from the cells. 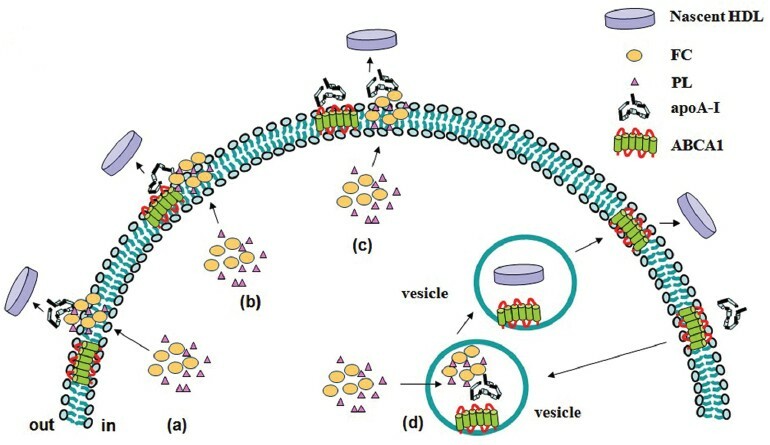 (D) ABCA1- and apoA-I-containing vesicles endocytose in cytoplasm, ABCA1 pumps lipids into the vesicle lumen and then apoA-I is lipidated. HDL is released through exocytosis. Heterogeneous nascent HDLs formation was observed in several studies when incubation of apoA-I with Chinese hamster ovary cells (94) and THP-1 macrophages (95). The presence of extracellular apoA-I induced the formation of 9 and 12 nm particles containing around 3:1 and 1:1 PL/FC (mol/mol), respectively (96). However, detailed mechanisms of formation of discrete-sized nascent HDL and their characteristics are needed for further investigations. One possible explanation is that ABCA1 lipidates apoA1 with PL first to form phospholipid rich nascent HDL particles, and then removes cholesterol from cells by diffusion 20, (97). ABCA1-mediated FC and PL efflux may be uncoupled 20 (98) and different cell lines have shown nonparallel apoA-I mediated FC and PL efflux (66). ABCA1 is highly regulated at both the transcriptional and posttranscriptional levels. Studies have proved that inhibiting ABCA1 degradation results in increased ABCA1 and HDL biogenesis. Ginkgo biloba extract (EGb761) (99), spiroquinone (100), diphenoquinone (100) and calmodulin (61) have been found to increase the protein stability of ABCA1 by reducing calpain activity without affecting ABCA1 mRNA expression. On the contrary, probucol inactivated ABCA1 in the plasma membrane with respect to its proteolytic degradation by increasing calpain activity (101). Cyclosporine A inactivated ABCA1 in a very similar manner to that of probucol for its biological functions and susceptibility to calpain in the membrane. Cyclosporin A treatment also decreased ABCA1 turnover and yielded a two-fold increase in cell-surface, but decreased apoA-I uptake, resecretion and degradation in RAW cells. Taken together, cyclosporin A treatment induced a 33% reduction of HDL levels in mice (102). In addition, other factors also can influence the functions of ABCA1 via different mechanisms. ABCA1 degradation also is promoted by the ubiquitin proteasome pathway that is activated by an excess of free cholesterol (103). Thiol protease inhibitors increased the levels of ABCA1 protein and slowed its decay in THP-1 macrophage-derived foam cells, whereas none of the proteasome-specific inhibitor, other protease inhibitors or the lysosomal inhibitor NH4Cl showed such effects (40). Advanced glycation end product precursors impaired ABCA1-dependent cholesterol removal from cells. The reactive carbonyls glyoxal and glycoaldehyde acutely and severely impaired the ABCA1 pathway, presumably by directly damaging ABCA1 protein, and abolished its binding of apoA-I (104). ApoA-I and ABCA1 mutants also have been used to show an association between the cross-linking of apoA-I to ABCA1 and lipid efflux. Angeliki et al. correlated the cross-linking properties of several apoA-I mutants with their ability to promote cholesterol efflux. They found that amino-terminal deletion and double amino- and carboxy-terminal deletion mutants of apoA-I competed effectively the cross-linking of apoA-I to ABCA1, while the carboxy-terminal deletion mutant apoA-I competed poorly. These findings provided a direct association of different combinations of apoA-I helices with a complementary ABCA1 domain, suggesting mutations that alter ABCA1/apoA-I association affect cholesterol efflux and inhibit biogenesis of HDL (21). ApoA-I/ABCA1 cross-linking in Tangier disease patients was reduced dramatically to 5% to 10% of the WT groups. The ABCA1 has two large extracellular loops, probably linked by a disulfide bond, located on each of the two transmembrane domains (105,106). Importantly, many ABCA1 missense mutations causing Tangier disease have been identified in these loops (107). A functional test of these mutations in transfected cells revealed defects in apoA-I binding and cellular lipid efflux. Three naturally occurring single amino acid changes in the two largest extracellular loops of ABCA1 (Q597R, C1477R and S1506L) had dramatically reduced the cross-linking efficiency of ABCA1 to apoA-I. In addition, for all ABCA1 mutants, there were profound deficits in efflux activity of lipids, which were measured by cholesterol efflux assays (105). The C-terminal VFVNFA motif of ABCA1 has been shown to be essential for its lipid efflux activity. Alteration of this motif did not prevent trafficking of the transporter to the plasma membrane, but did eliminate apoA-I binding to ABCA1 (108). Interestingly, one substitution mutation (W590S), however, reduces apolipoprotein-mediated lipid efflux severely but increased apoA-I binding moderately (105). These results suggested that apoA-I directly binds ABCA1 at the cell surface without requiring the ability of ABCA1 to mediate lipid efflux. The moderate increase in apoA-I binding to W590S may imply that dissociation of apoA-I from ABCA1 could be facilitated by lipid efflux to apolipoproteins and is consistent with the earlier finding that ABCA1 binds apoA-I but not HDL3 (17). The observation of apoA-I mutants may provide new insight into the apoA-I/ABCA1 interactions. ABCA1-mediated efflux of cholesterol and PL were decreased moderately by apoA-I amino-terminal deletions and were diminished by carboxy-terminal deletions in which residues 220–231 were removed (109,110). These findings suggest that residues 220–231 of apoA-I are necessary to functional interactions between the full-length apoA-I and ABCA1, though the central helices of apoA-I alone can promote ABCA1-mediated lipid efflux. Phospholipid vesicles containing a natural occurring mutant form of apoA-I (R173C), called apoA-I(Milano) (apoA-1[M]), reduced atherosclerosis in animal models (111,112) or human subjects (113). While Alexander et al. demonstrated WT apoA-I and apoA-I(M) are equally efficient at promoting macrophage reverse cholesterol transport, suggesting that if apoA-I(M) is more atheroprotective than WT apoA-I it is not attributable to an enhancement of macrophage reverse cholesterol transport (114). The binding of apoA-I to ABCA1 promotes cellular cholesterol and phospholipid efflux. Both apoA-I and ABCA1 play critical roles in the formation of HDL. Therefore, understanding the mechanisms by which pre-β HDLs are formed through the interaction of apoA-I with ABCA1 would fill in the molecular details into HDL formation process and further help to develop strategies to increase plasma HDL concentrations. In this article, we have reviewed the possible manners of the apoA-I and ABCA1 interactions. ApoA-I markedly increases the protein level of ABCA1, which in turn stabilizes apoA-I. The interaction not only executes inside-out effector functions, such as cholesterol and/or phospholipid efflux, but also mediates outside-in signal transduction. The apoA-I/ABCA1 interactions may have multiple biological effects that are lipid export dependent or independent. Although several possible signal transduction pathways have been mentioned in our current review, a clear consensus on which pathway acts as the critical regulator is still unknown. Additional studies are needed to identify the molecular components of the apoA-I/ABCA1 pathway mediating its antiinflammatory activity, and to determine its contribution to disease protection in humans. Many factors could influence the binding of apoA-I/ABCA1. Studies of apoA-I and ABCA1 mutants have also shown an association between apoA-I cross-linking to ABCA1 and lipid efflux. In summary, further work needs to be undertaken to unravel the functions of the binding of apoA-I to ABCA1 and the signal transduction pathways initiated by the interaction so that we can uncover novel therapeutic targets for treating interrelated diseases. 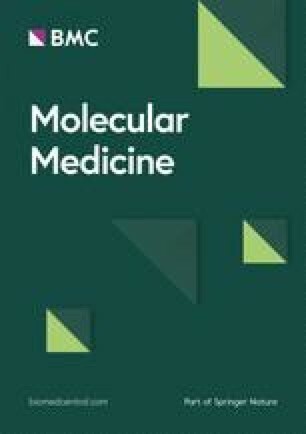 The authors declare that they have no competing interests as defined by Molecular Medicine, or other interests that might be perceived to influence the results and discussion reported in this paper. The authors gratefully acknowledge the financial support from the National Natural Sciences Foundation of China (81170278, 81070220), Heng Yang Joint Funds of Hunan Provincial Natural Sciences Foundation of China (10JJ9019), and Aid Program for Science and Technology Innovative Research Team in Higher Educational Institutions (2008–244) of Human Province, China. Open Access This article is licensed under a Creative Commons Attribution-NonCommercial-NoDerivatives 4.0 International License, which permits any non-commercial use, sharing, distribution and reproduction in any medium or format, as long as you give appropriate credit to the original author(s) and the source, and provide a link to the Creative Commons license. You do not have permission under this license to share adapted material derived from this article or parts of it. The images or other third party material in this article are included in the article’s Creative Commons license, unless indicated otherwise in a credit line to the material. If material is not included in the article’s Creative Commons license and your intended use is not permitted by statutory regulation or exceeds the permitted use, you will need to obtain permission directly from the copyright holder.